BEWARE OF COUNTERFEIT OFFERS! Simple Ecology designs, manufactures and EXCLUSIVLY sell our products directly to consumers online, no wholesale middlemen. Any other online seller is not offering genuine new Simple Ecology product. 3 Pack - X-Large (14 in. x 18 in.) bag with drawstring. Sewn in EXTERIOR tare weight tag makes checkout credit easy. Excellent for storing produce in the refrigerator. A damp bag will help greens stay crisp for days. Made in India of first-grade 4 oz. Organic Cotton Muslin Fabric, certified according to Global Organic Textile Standards (GOTS) for Ecology & Social Responsibility. 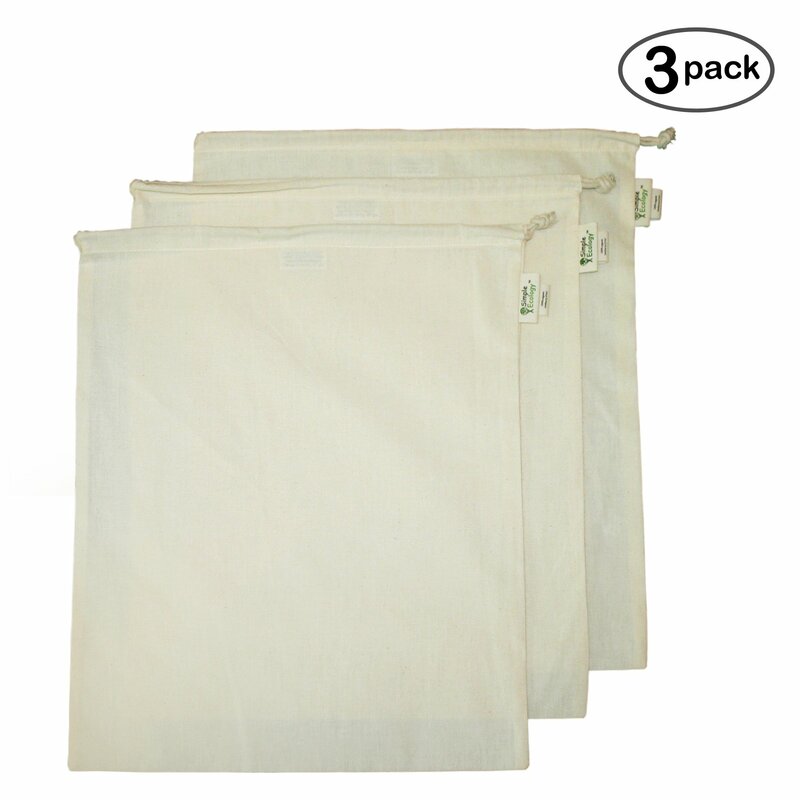 Size:XL (14"x18") - 3 Pack Cotton Muslin Produce Bags are our most versatilereusable bag. They eliminate the need for plastic bags and are great for bothshopping and storage. The fabric allows for good air circulation, ideal forpantry storage. When dampened they provide a moist blanket keepingrefrigerated greens nice and crisp and avoiding the slimy mess that can occurin plastic bags. Cotton Muslin is a smooth and delicate fabric that wearswell. Easy to care for, just wash them in cold water and line dry (expectabout 10% shrinkage on first wash). Our bags are made of UNBLEACHED ORGANICCOTTON. Although higher in cost, it provides huge benefits to the environmentand our health by avoiding the highly toxic pesticides, fertilizers andprocessing chemicals used in regular cotton crops. For larger fruits andvegetables see our Organic Cotton Reusable Mesh Produce Bag.